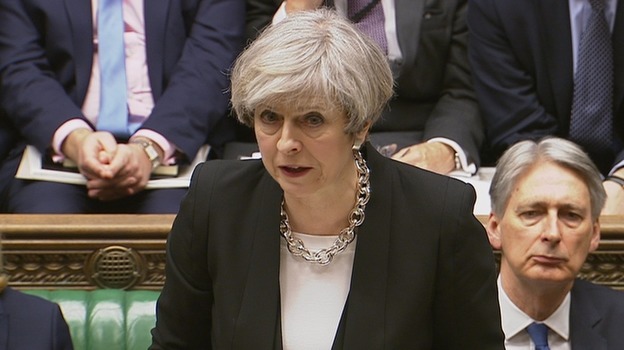 “We are not afraid and our resolve will never waver in the face of terrorism”, Theresa May said in a statement to the House of Commons. The Prime Minister said that Wednesday’s terror attack has tried to “silence democracy” and the “free speech, liberty, human rights and the rule of law which are embodied in Parliament”. Ms May continued that the “terrorist took out his rage on innocent men, women and children”. Ms May also paid tribute to Pc Keith Palmer who was “every inch a hero and his actions will never be forgotten”. She also praised the emergency services as a whole, saying she paid tribute to them on behalf of the whole country. The Conservative MP added that the attack showed “the worst of humanity, but we will remember the best”, continuing that the “greatest response to attack lies in the everyday acts of people”, and that “in the millions of acts of normality we find the best response to terrorism”, praising the fact that the terror attack had not cowed London. The Prime Minister also thanked “friends and allies around the world for standing with us”.